A show created for people who struggle with THEIR life after faith. Listen to stories of those who have survived the journey and have learned that there IS Hope After Faith! How Can Jerry Be Sooooooo Humble??? #068 - Should atheists quote the Bible back to believers? Hope After Dark is the dark side of Hope After Faith. Listen as your hosts Jerry D and Bobby C unleashes their dark side in the most humorous way. Jerry lets you in even more by sharing the truth Between the Pages of Hope After Faith, while also bringing you along on his journey into the Real World. 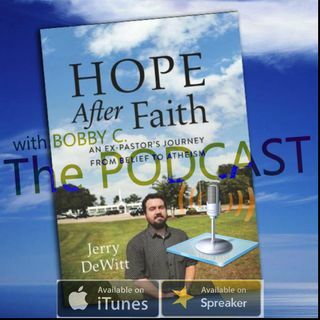 These Episodes will feature crossovers of Hope After Faith and Living After Faith podcasts.